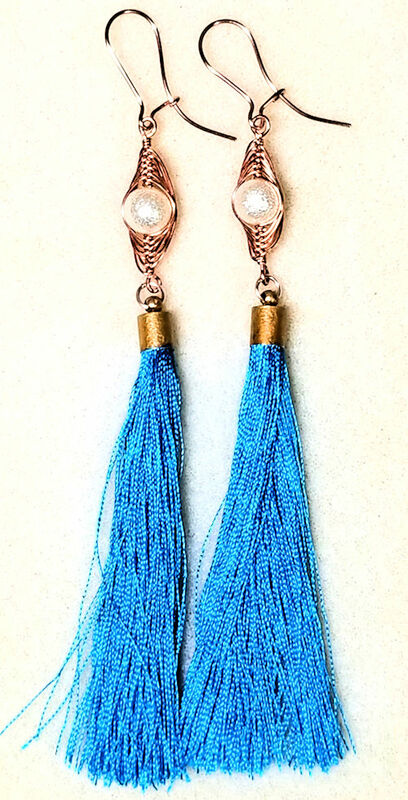 Beaded Jewelry Diva - Make Beaded Jewelry! 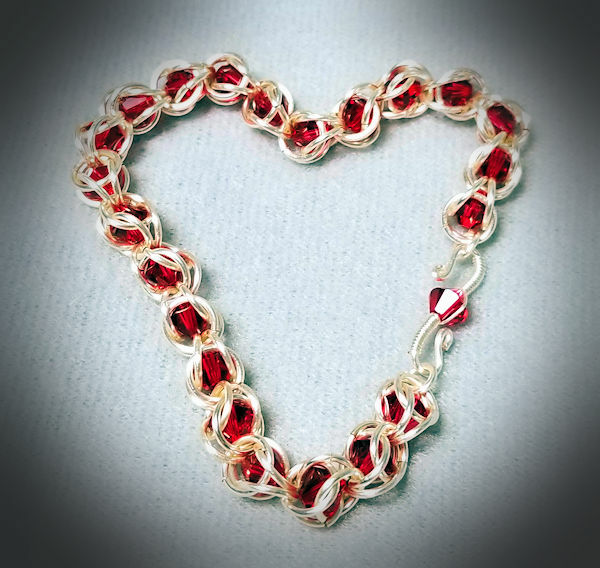 A beaded chainmaille tutorial you ask? Well, you did ask, so here’s the first of my projects! The beaded chainmaille bracelet jewelry video tutorial is below, but before we get there, let’s talk about jump rings a bit more first. I do have a more in-depth post and free PDF about jump rings, but let’s do a quick overview, so you can make sure you have the right rings for the project. It’s sturdy enough to not warp easily. For the project, you will need 18 gauge jump rings that have an ID of 6mm. You can go as low as 5.9 or as high as 6.5, but 6mm is the “sweet spot”. You’ll also need some smaller rings for the ends — I think the ones I used were around 4mm, but you could use 3.5mm if that’s all you have. And if you only have the 6mm rings, you can use those as well! I just happen to like smaller rings for the ends. For the beads, I highly suggest you use 6mm bicones. The reason is that the bicone shape lets the beads “snuggle down” and lets the top rings close easily. While you can use fire-polished or round beads, I don’t suggest you use them for this particular project — they make it very difficult to get the top rings closed. Clasp — What to Choose? The clasp is whatever you want to use. I made an S clasp, one that uses the same bead as in the bracelet. There is nothing stopping you from using anything else, though. If you want some ideas for making your own clasp, check out my clasp-making tutorial post. Ready, Set — Here’s the Video! Without further ado, here’s the video for the beaded chain maille jewelry tutorial — I hope you enjoy it! How to make a clasp…is it difficult? No, it’s not, as long as you have some wire and feel like playing! Making your own clasps gives you the opportunity to customize your jewelry even further. It also helps when you realize you don’t have a clasp the right size, LOL. You can make one just as large or as small as you need! Clasp Wire – What Gauges to Use? 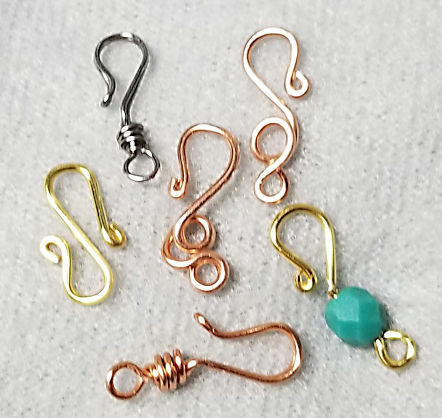 Ideally, you would use 18 gauge or 16 gauge for any clasp design that is made from a single wire (as opposed to some clasps which have a doubled wire). Most often, I use 18 gauge wire, and I will work-harden it afterwards with a rubber mallet or a chasing hammer. However, I don’t always need to do the work-hardening for 18 gauge, especially if my jewelry project is lightweight. If I have a design that uses doubled wire, I tend to use either 20 gauge or even 22 gauge. If I have a design that uses any wire weaving techniques, 20 gauge is my favorite, as the wire weaving stabilizes the wire. Now most jewelry wire is sold as “dead soft”, which is ideal for shaping. However, if you don’t want to fiddle around with work hardening your 18 gauge wire, you can try using half-hard wire. It’s more difficult to shape, but it holds that shape well. Keep in mind that when I talk about gauges, I am referring to the “AWG” gauge, which is the traditional measuring system for jewelry wire. If you pick up some wire listed as “SWG”, keep in mind that anything under 20 gauge has a different wire diameter — it’s generally one size larger than AWG. It makes a difference as to how easily the wire bends. Time to Make Some Clasps! Here’s a video on making clasps — just a few ideas. These are fairly simple, and meanwhile, I am thinking up some other designs that are a bit more elaborate, for when you want that extra-special touch!